I’m hosting an online Pampered Chef party…for only a few more days! 🙂 (Today is the LAST DAY, Jan. 27! Don’t miss out!). To celebrate, I’m featuring some of my favorite Pampered Chef items here on Suzanne Shares. Missed previous posts? Read all of them including the previous 14 favorite Pampered Chef items I featured here. Well, you know what I did?!?! I did exactly what Kae did! 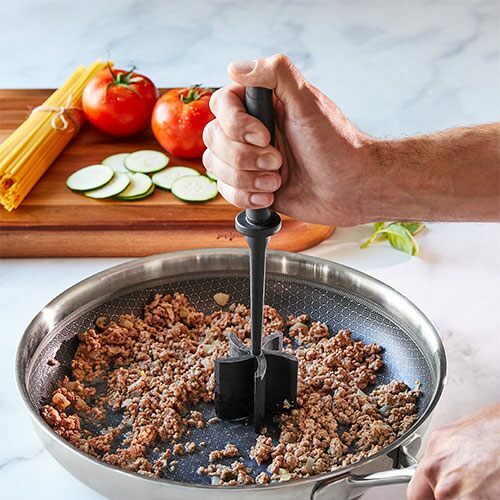 I immediately went out and bought my own after watching Kae cook with this amazing ‘wild looking contraption.’ The chopping design of the Pampered Chef Mix and Chop cuts the hunk of ground beef as you are cooking it. Do you know how, once the raw ground beef (or turkey, chicken or sausage, which this also works with!) is in the skillet, it is in one massive hunk?!?! The Mix ‘N Chop allows you to, literally, chop it while stirring and cooking it. Have you ever done what I used to do in my pre-Mix ‘N Chop days? Do you try to saw through the meat with a spatula (which is quite difficult, I might add) in order to make it cook evenly and faster? Or, do you try to stir the big massive chunk of meat with your spatula, flip it over and slosh hot grease on you? (Or, was that just me!?!??) Anyway, those days of mine are gone, and I’m so relieved! This little tool is only $11.50, and it is worth every penny! The moral of the story is this–yes, my kitchen flooded, which wasn’t fun. However, getting new floors (thanks Rob and Serve Pro of Belle Meade and West Nashville), vacationing a few days with our friends during the floor renovations while my husband was on another continent, and discovering the Pampered Chef Mix ‘N Chop were very much a “making-lemonade-out-of-a-lemon” kind of experience! TODAY IS THE LAST DAY TO ORDER (Jan. 27).To participate in my Pampered Chef online show, go here. Click on the “Shop” button on the upper left-hand corner, and shop away! Get one of these items free when you spend $60. Thanks to my fabulous neighbor, Aimee Howell, wonderful Pampered Chef consultant for allowing me to host a party! And…no worries if you don’t live anywhere near me! When you order online, you can have it shipped directly to your door! Oh, how I love shopping online.